Do you have a child in Scouts? I do, and I'm amazed by the amount of patches they get, I remember back in the day the patches were few and far between, now there is a patch for everything and they all need to be attached to their vest/uniform. Most of the new patches are iron on but I've found they don't stay on well so my solution was Krazy Glue, it works great, super easy to attach and they stay on!!! When gluing put a piece of wax paper underneath and on top, then put a heavy object on top and let it dry. Don't miss out on this high value printable coupon, $2 Off Alaway Antihistamine Drops. 5 FREE Baby Leggings, just pay shipping! Choose 5 FREE Baby Leggings, at checkout enter the code ENBABY and the entire cost of your Baby Leggings will be deducted, just pay shipping. Win a Hip Mama StrollAir My Duo in red, a $799.99 value. Eliminate garlic and onion odors from your hands with this tip, no harsh chemicals! 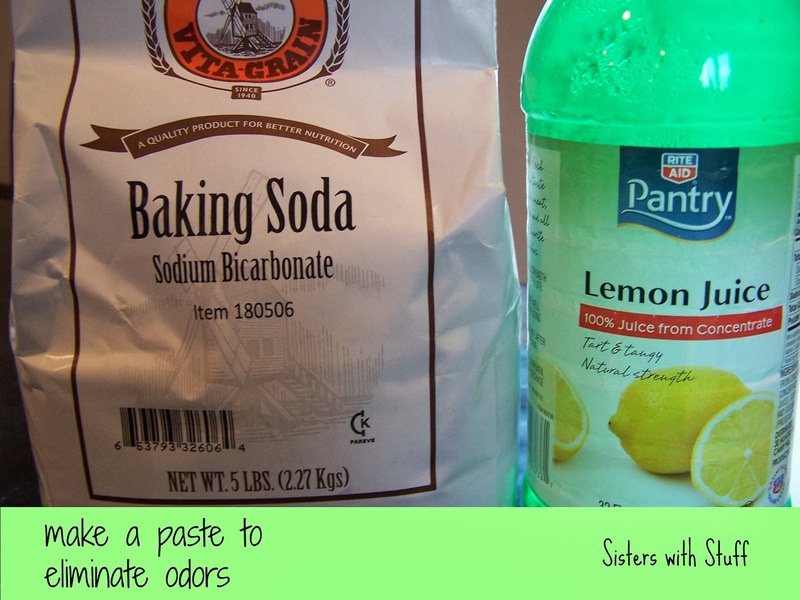 To eliminate odors like garlic and onion from your hands try making a paste of Lemon Juice and Baking Soda, rub together. You can also try a dab of table salt, the salt absorbs odors. 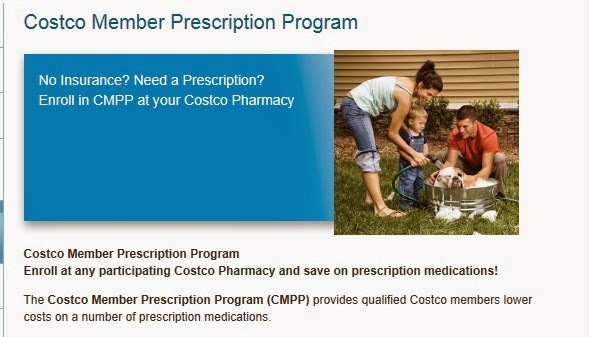 Costco offers the Costco Membership Prescription Program provides qualified members a discount on certain prescription medications, it's not insurance and it's only for a certain list of medications. Here's the cool thing, at one point my dog was taking a prescription that was a regular human drug, I got it filled at Costco because I figured it was cheaper, they had me enroll my dog in the CMPP program because this particular drug was on the list of drugs that could be discounted and your pet can be enrolled as a dependent. Go to www.Costco.com for more details, or go to the Pharmacy with the name of the prescription that your pet is taking to find out if it is one of the discounted prescriptions. Worth a shot, in my case it was great because this drug was an expensive immunosuppressant that he had to take every day for the rest of his life. Now I've seen it all, Hey you gotta love the entrepeneurial spirit. 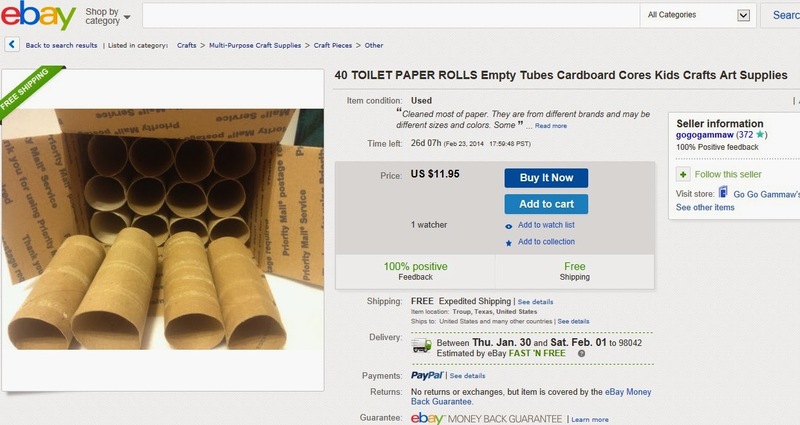 I thought I was good at finding stuff to sell on eBay, obviously I need to think more outside the "roll". How I'm getting my Antivirus Software Free every year! 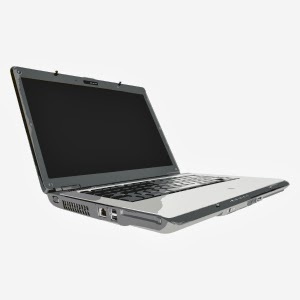 I'll preface this post by saying: I'm not a computer expert, this is just my experience and humble opinion. In the past I bought name brand Antivirus software, installed it on my computer and then every year before it expired it would renew automatically because they had my credit card on file, yes it was convenient but it was getting expensive....$80 every year. I started seeing deals where you could buy the software and get a full rebate, so now I buy a brand new one every year, I get it FREE every time because there is always a rebate for the full amount or partial amount on some. The only downside is that you do have to reinstall every year when the old one expires but I'm willing to do it. I find great rebate deals on software at Frys.com and they usually offer free shipping so I don't even have to spend gas money to go buy it, you can also check Newegg, Staples, Office Depot for rebate deals. Perfect Valentines Day Gift........FREE 8x10 photo canvas or $40 off a larger size, just pay shipping! This would be a great gift, turn a photo into a canvas. Canvas People-get a FREE 8x10 or $40 off a larger size, just pay shipping. 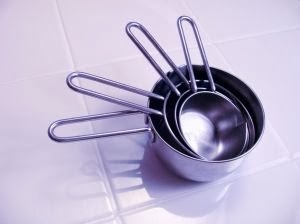 When you measure stuff like peanut butter and cream cheese or honey it's hard to scrape out of the measuring cup or spoon, rinse the inside of the measuring cup or spoon with hot water before, and the food you are measuring should slide right out. Freeze your child's drink box or pouch.........works as an icepack and is thawed by lunchtime. I love this idea because it works for different situations, works great for school lunches, freeze your child's drink boxes or pouches and then when you pack it in their lunch it keeps the other items cool and it's thawed out just in time for lunch. No need to use icepacks, if you are going on a picnic or hike or even just an outing, the frozen pouches keep your other items cool and you don't have the added weight of ice packs or the mess of melted ice. I also freeze the tubes of yogurt, keeps the yogurt cool and by lunchtime it's melted. One of those Mom moments that makes you want to laugh and cry at the same time because it is so precious. 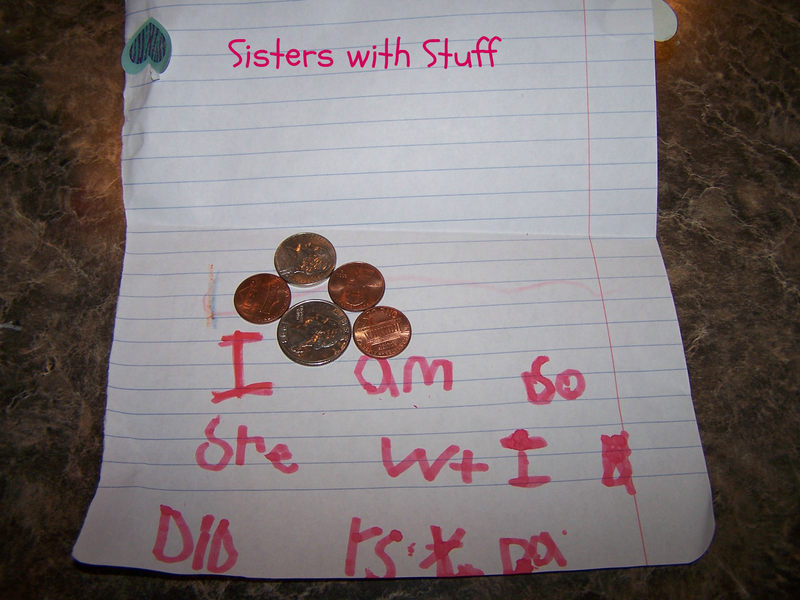 I received this note and money from my 6yr old this morning as a peace offering after a big meltdown she had last night. I'll translate: "I am so sorry what I did yesterday" and .33 cents. You can't make this stuff up...............and I don't know how she decided on .33 cents, I went in her room this morning after she left for school and found her piggy bank dumped out on the floor so either she just grabbed some coins and called it good or else decided .33 cents was the appropriate amount for this apology. Sweeeet Momma's going to the Casino! If your mascara is getting clumpy, try this trick to get a few more uses out of it! You want to get the most out of the stuff you buy right? When your mascara starts to get clumpy you just assume it's dried out or it's all gone so you just toss it, there is actually a lot more mascara left. You can get more life out of your mascara by putting it in a cup of hot or boiling water, it melts all the stuff that has dried and makes it like new, you get a lot more uses out of it. If you are in a bind just run it under hot water for a while or you can try to add a few drops of sterile saline solution and mix it really well. Another $2.99 DVD from Amazon, The Internship! Another Hot Movie Deal from Amazon The Internship on DVD is only $2.99 right now, ships FREE if you have Amazon Prime or if your order is $35 or more. Awesome price on Amazon Horton Hears a Who on DVD only $2.99! Hot price at Amazon: Horton Hears a Who (Single-Disc Edition) only $2.99, plus it ships FREE with your Amazon Prime account or if your order is over $35!! Huge List of Printable Coupons for Football Watching Fixings. Chances are if you are watching a football game today you are going to end up eating junk food, no shame, no judgment. If you have to buy it today you can at least save a little money, here's a huge list of coupons for football watching fixings. I thought this was really interesting, different kinds of foods placed strategically in your fridge to keep them as fresh as possible. I'm all about saving money so this is right up my alley, check it out!!!! Ink Cartridges are expensive, I print a lot of stuff so I'm always looking for ways to reduce the amount of ink I use in my printer. There's a few things I do that help: Go to your Control Panel and then depending on your computer (Sorry, I don't know the settings for Mac), devices or printers, from there you want to look for "printing preferences". I set my computer to print in "Grayscale" and I've told it to only use the black ink cartridge, black is cheaper than color and if I do need to print in color I can just temporarily change it back. 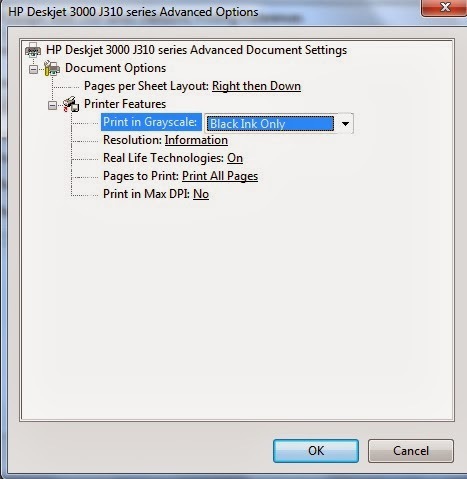 If you don't change to "Black Ink Only" it can still be using ink from your color ink cartridge even if you are only printing black. I've also changed my printer to print "Fast Draft", it still prints out great for coupons or just everyday things you need to print. If you are doing an important project or printing photos you can go back in and temporarily change it. Changing to Fast Draft saves a ton of ink, you'll be amazed how much longer your ink cartridge lasts. Another thing you can try is changing your default font to a font that uses less ink. 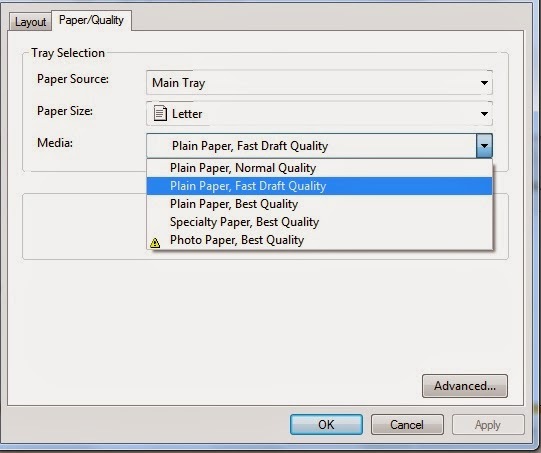 Some fonts are fatter and have more details so it uses more ink to print. I don't know how much ink you can save, I haven't been able to tell a difference in how long my ink cartridge lasts but you could try it, every little bit helps right? I haven't done this yet (just cuz I'm lazy) but you can download a free font called Ecofont that was created to save ink, it has tiny holes in the font to use less. It's supposed to be similar to Arial, Arial is a common default font but uses a lot more ink. If you want to find deals on Ink Cartridges you'll want to check eBay, I've been able to score some good buys, the inventory changes so check back often.